East Coast Lows: NSW one week, QLD the next? 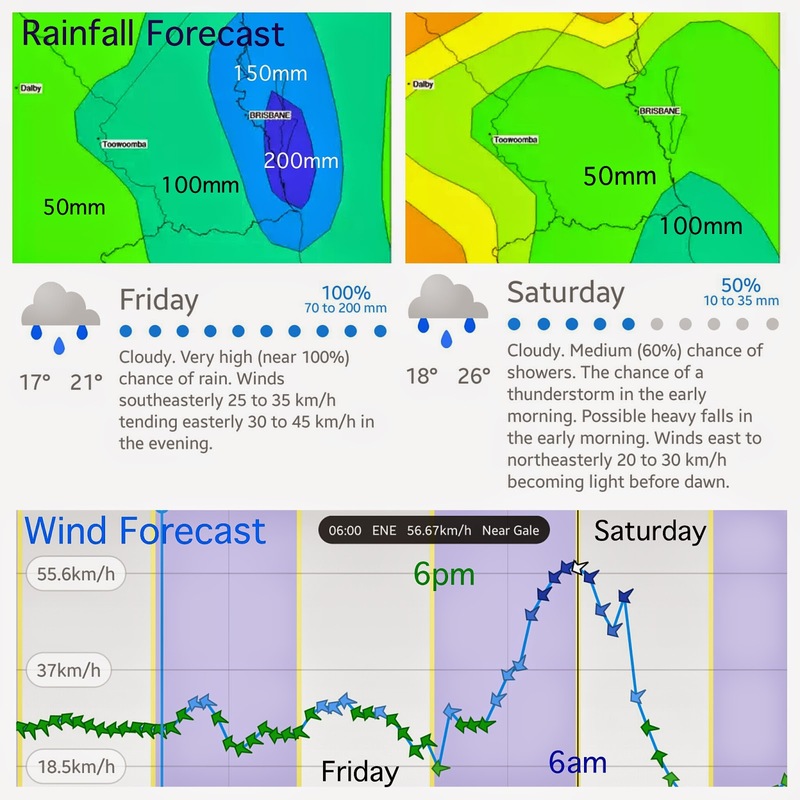 Heavy rain totalling 200-400mm, damaging winds up to 90 km/h, dangerous surf with significant beach erosion, and tides 0.5m above normal are set to batter the Gold Coast and south-east Queensland on the first day of May 2015. A Severe Weather Warning is in place, as a strong upper trough is set to move east into the south-eastern interior of Queensland on Friday and then will move off the southern coast during Saturday. A surface trough will deepen near Fraser Island during Friday, with a low pressure system most likely developing and slipping southwards over southern Queensland waters during Friday evening and Saturday morning. A moist wind flow to the south of the surface trough is expected to combine with the upper feature to generate heavy rain, which may lead to flash flooding, over areas southeast of about Hervey Bay to Taroom to Stanthorpe. Whilst most of the rainfall so far today (Thursday) has been to the north, the Gold Coast is going to bear the brunt of the wild weather tomorrow. Since 9am the highest rainfall so far today was 21mm at Stieglitz Wharf, 14mm at Pacific Pines and 11mm at both Tallebudgera Creek and Springbrook. Traditionally the heaviest rain associated with an East Coast Low (and Tropical Lows and Cyclones) is towards the south and east of the actual low pressure system. Rainfall totals of 50-150 mm are forecast over inland catchments, with totals of 200-400 mm over coastal catchments, possibly more locally. The heavy rain areas should contract southeast during Friday, gradually clearing the Gold Coast during Saturday morning. As the low pressure system and associated offshore surface trough tracks south, strong to gale force winds with possible damaging gusts of up to 90km/h will develop after the heavy rain and now expected to peak around 5-6am Saturday morning. The low will also most likely generate large swells as it slips southwards during Friday and early Saturday, with dangerous surf developing about Gold Coast beaches. Water levels in these areas could exceed the highest tide of the year by around half a metre on Friday evening's high tide. The dangerous surf conditions are likely to produce significant beach erosion for these areas during Friday and early Saturday. A flood watch is in effect which includes all Gold Coast catchments (Nerang River, Coomera River, Albert River and Gold Coast creeks). River level rises above the minor flood level are possible, particularly over the coastal catchments. Heavy rainfall may also lead to localised flash flooding. The City of Gold Coast Disaster Management Unit is monitoring weather reports and everyone is urged to be aware of the likelihood of flash flooding. With predicted heavy rainfall, roads may need to be closed. Information on road closures can be found at www.qldalert.com or 131940. Severe weather and flash floods are a dangerous reality of coastal living. What? I hate both extreme cold and hot. It's life taking for me.My husband use, cabled weather stations for life of me. I am living my last breathes.